Numerous color samples of wood and fabric made it possible to pick the right tone and shade for the space. It’s rather scary to commit to buying art you’ve never seen. Looking back at my interactions with Anne, however, I realize she had led me through essential steps to the perfect piece, i.e. one that delights me. First we made sure that the timing would be right for both of us. I had a crowd of company coming in a few weeks, and overnight guests two weeks later. Still, I didn’t want to push the creative process. I know how long it can take to come up with and carry out the right idea. We agreed on a goal, but I assured Anne that the end result that I would live with for years was more important than who saw it next month. After I showed Anne a photo of the area I wanted to cover, we agreed on the price. My original idea of a woven tapestry would be expensive, Anne advised me. If she made a patchwork of hand-dyed fabric, on the other hand, she could do it for about a third of the price. I considered a moment. I’d never seen a patchwork of hand-dyed fabric. But I knew Anne well enough to know that she took great pride in her work and wouldn’t create anything that she wouldn’t be proud to have everyone see. Besides, the price was well within my budget. I knew that if I weren’t pleased, I could afford to try something else. I would return to those two thoughts often as I traveled this unknown road with Anne. Anne Bossert sketched four possible designs for textile art on commission. Wood as well as fabric color had to be considered for mounting the textile. Planning came next in several phases. I provided Anne with measurements, and samples of upholstery in the room. And Anne provided me with choices of texture, of color, and of design. 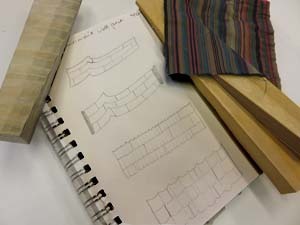 She gave me numerous samples of wood and fabric to view in lighting at home. Anne honored all my selections. 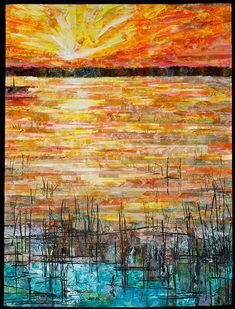 A computer rendering of textile art for a specific area assured Anne Bossert that plans were appropriate for the space. I had plenty of constraints for her. Together we planned exactly where the wall hanging would begin and end, and when I picked a design with a peak, we planned where that would be too. I wanted the wall hanging to include wood in some way, dyed and cut in what I think of as her signature look (more on that later). I needed it to be mounted so that someone coming down the stairs beside it wouldn’t be overwhelmed by any protrusion. Finally, I decided I wanted shades of gold for most of the textile, but I wanted a bit of green too – a symbolic meeting of the earth with the cosmos. I loved taking part in the planning process. I witnessed Anne’s gift for listening, for asking questions when she isn’t sure what her client means, and especially for responding gracefully when she feels there may be a better idea. 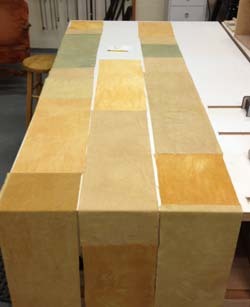 Strips of hand-dyed cotton and silk await final fabrication at Anne Bossert’s studio. Anne knew that she didn’t need to formulate several colors of dye to achieve a look like the one in her computer rendering. Various weights and weaves of both cotton and silk absorb dye differently, so only one formula for gold was needed. She didn’t shown me samples of green until I had chosen a specific gold hue. She used the formula for the gold I chose as a base for creating green. I liked the mottled look that could be achieved with hand dyeing. Anne explained that the less she manipulates fabric while it’s in the dye, the more mottled is the end appearance. 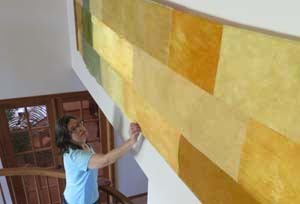 In the finished wall hanging, there are varying degrees of mottling from piece to piece. 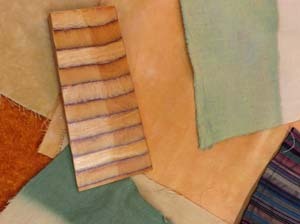 The same dye that colors fabric colored these wood components of a wall hanging by Anne Bossert. To mount the fabric on the wall, Anne designed and dyed three pieces of wood that would hold the fabric in position and conceal the screws that would in turn hold the wood to the wall. 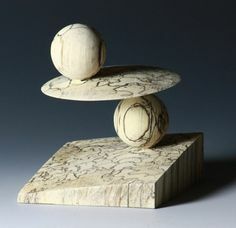 Anne always selects high-quality plywood and uses it artistically to great advantage. The same dyes that color fabric will color wood, and applying them to the lines in plywood creates an intriguing striped effect. 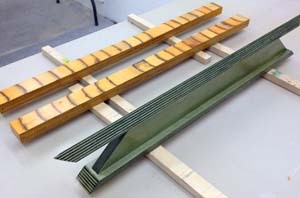 The stripes you see on the gold-toned wood in the photo at right weren’t painted on; they’re the natural result of applying dye to plywood that has been cut at an angle to reveal its layers. It’s what I’ve referred to as Anne’s signature look. 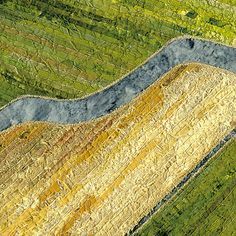 A triangular pattern of thread holds the textile to wood supports anchored to the wall in this fiber art by Anne Bossert. 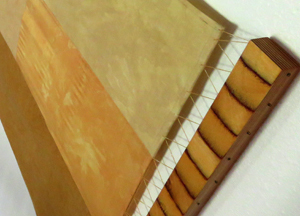 Anne used thread anchored with copper pins to fasten the fabric to the wood pieces at each end. I was delighted with the result; to me, the repetitive triangles of thread add charm and interest. The wall hanging was ready to install by the beginning of October. This isn’t a piece you can hang on a picture hook. Anne came to the house to install it herself, loaded with levels, tape measure, screws, drill — even an iron and ironing board for a last-minute press. 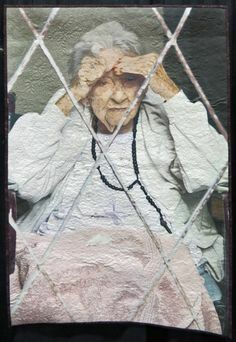 Anne Bossert checks the drape of her cotton and silk fiber art. 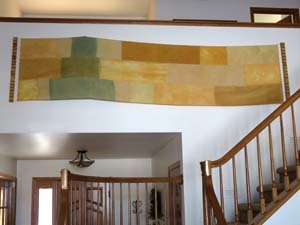 The first thing she placed on the wall was the uniquely shaped green support pictured at right above. Intriguing as it is, it can only be seen looking down or up into the wall hanging. 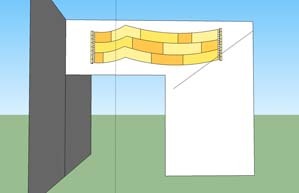 The tip of it holds the fabric at a peak, and the remainder makes the fabric angle away from the wall, giving dimension to the overall effect. I would never have thought of it. 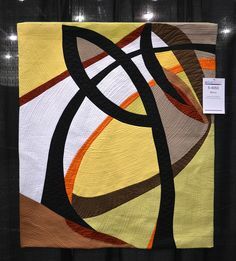 Neither would I have thought of allowing the fabric to curve slightly out to the end rather than hanging straight across. These were the dramatic touches of the artist at work. It had taken a lot of communication and planning followed by a lot of letting go on my part to bring to fruition the art that has given me so much pleasure. 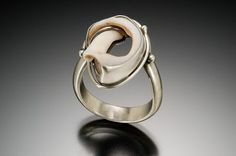 You can read more about Anne Bossert’s work in the post of August 13, 2014 and on her website. Beautiful. I must come see it someday soon. Thanks, Kathy. Do come see it! What a lovely article, Sally! Thank you! It also helped that you were a kind and enthusiastic client. It was a complete pleasure to work with you. Thank you for supporting a local artist! I’m glad you’re pleased with my work, Anne, as I was with yours. Anne created a stunning red cabinet for our entry this fall. Couldn’t be happier with the artistic process and the finished piece. 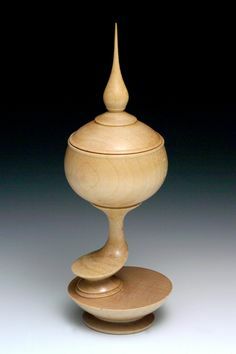 Yes, I saw a picture of this in its place in your home. It looks wonderful with the painting you placed above it to repeat the red color. Sally, you do a great job of explaining and describing your subject. A very nice article about my favorite daughter and artist! Thank you, Ellie. It’s such a delight to work with Anne. I agree, Phillippa. I’m particularly impressed by the three-dimensional aspect of her designs.